450VA Back-UPS ES 120V 8 Out. 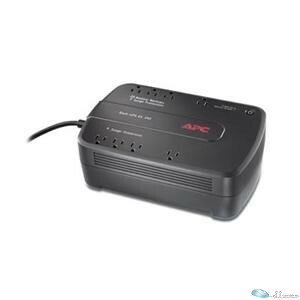 Description : 450VA Back-UPS ES 120V 8 Out. Info : APC's Back-UPS ES series is now "greener" than ever. The ES 450 utilizes an ultra-efficient design that consumes less power during normal operation than any other battery backup in its class, saving you money on your electricity bill. It's also RoHS compliant, which means its manufacture and ultimate disposal is easier on the environment. Even the packaging has been carefully selected to minimize energy use in it's creation, and to maximize the use of recycled materials. Coupled with all the standard features of the Back-UPS ES series, the ES 450 is the best value for home and home office computers.